2015 marks the first year that East Brother and I were able to attend the Toyota Grand Prix of Long Beach. It is an event that we have both been trying to find the opportunity to go in person to for a number of years now. With East Brother's return to California and a concerted effort to free up the Sunday in both of our schedules, we finally made it to the Grand Prix on April 19th, which also just so happens to be the main event: the Long Beach Grand Prix Indy Car race. 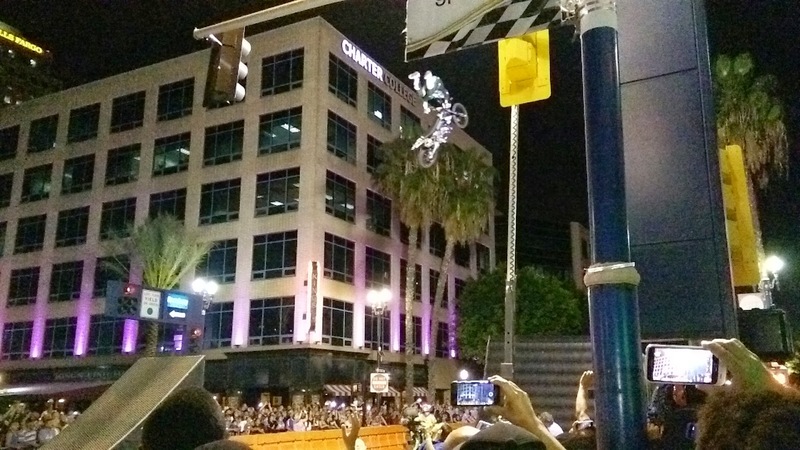 For those of you unfamiliar with the Long Beach Grand Prix, it is sort of like the Formula One Monaco Grand Prix in that the race is basically constructed using public roadways everyone drives [Editor's note: And rides bicycles on!] on every day. Every year, for a few days in April, the City of Long Beach closes down the roads near Shoreline Village to facilitate the transformation of city streets into a race track and brings in the spectacle that is an Indy Car race to the city that houses one of the largest ports in North America. All the excitement actually starts on Thursday night in Downtown Long Beach where Thunder Thursday kicks off just as people are leaving their offices. The full evening of events includes various performances, demonstrations, and even a pit stop competition where two teams would face off against each other to see who could complete a full tire-change pit stop the fastest. Many of the cars for the Pirelli World Challenge were out on display and drivers signed autographs for adoring race fans. It is quite the spectacle that snarls traffic in Downtown LB to a crawl, but really raises the profile for the entire weekend of excitement. Our day at the races started with East Brother and I checking out the cars from the celebrity race that took place on Saturday. Since the introduction of the Scion FR-S, the celebrity race has now been using those instead of the Scion tC from previous years, resulting in quite a few more white knuckle moments given the FR-S's more tail-happy nature. In a sign of the times, I admit that there were quite a few celebrity names that I did not recognize. Many of the cars had clearly sustained very heavy damage, causing East Brother to remark, "It's nice to know that the celebrities don't take it easy on each other." After briefly watching the practice session for the Indy Car race, we headed over to the paddock area where we got to see all the various teams making the final adjustments on their cars before the early afternoon race. It really is amazing to see these machines with their wheels and panels removed, giving the average person a brief glance into what the engine, the braking components, and all the other various systems look like that go into a modern open wheeled race car like these Indy Cars. Best of all, several of the drivers were preparing themselves to do battle by grabbing their pre-race meal and discussing strategy with their crew chiefs. It is one of those rare opportunities to peer behind the curtain of mystery that shrouds many of these highly funded professional racing teams. With a few hours still until the race would start, we decided to settle in and prepare ourselves for the actual Indy Car race. As the crowd sat anxiously waiting for the race to begin, each driver was introduced as they headed into the pit area for final preparations. At some point, sky divers carrying the American flag floated down to Earth as the national anthem was sung. At about 1:30pm, Sir Patrick Stewart (yes, the Patrick Steward, who played Jean Luc Picard in Star Trek and Charles Xavier in X-Men), serving as this year's race grand marshal, gave the command for the drivers to start their engines. And at 1:37, after a bit of drama involving a car unable to start their engine, the race began. At first, it seems as if Helio Castroneves was slated to win this year's Long Beach Grand Prix, taking the pole position at qualifying, and going with an aggressive plan to start with the option tires (softer, grippier) while most of the grid started with the prime (longer life, less grip) tires with the intention to switch off to the option tires during a pit stop. However, an early crash, at about five minutes into the race, pretty much ended Castroneves' hope of pulling a giant lead walking away with the win. Instead, Scott Dixon passed Castroneves during a mid-race pit stop, and he never looked back. The most intense battle took place between the four cars vying for third place. Juan Pablo Montoya, Simon Pagenaud, Tony Kanaan, and Sebastian Bourdais spent a good portion of the rice all clamoring for the third position on the podium. At the end, Montoya claimed victory in that battle and took a third place finish for the day. Now that the Indy Car race was over, there was one more race that East Brother and I decided to stay and watch for a little while: The Pirelli World Challenge sports car race. Personally, I have been following Real Time Racing back when they were still running Acura RSXs and first generation TSXs in the touring car class, and the racing series was still called the SPEED World Challenge. Now, Real Time Racing is running two Acura TLX-GTs in the GT class alongside cars from Porsche, Ferrari, Bentley, and other exotic and sports car manufacturers. This was a big deal because Acura is the only manufacturer in this series that is running a four-door sedan instead of sports car. So far, the twin-turbo V6 powered TLX-GT has been doing reasonably well. Here at Long Beach, the two Real Time Racing Acura TLX-GTs placed sixth and ninth. Not a bad result considering that this four door sedan just beat a ton of dedicated sports car. Overall, attending the Grand Prix was an amazing experience. Sure, it was crowded, and the sun blazing down did get uncomfortable after a little while, but just seeing all the race cars in person, as well as listening to the sounds these cars make while they are doing all out on the track really gave me goosebumps. After being a car and racing enthusiast for so many years, I cannot believe it has taken me this long to get out and see a real live race. All I can say is that I would happily do it again. To see all of the hundreds of photos we took during the weekend's events, visit our Photo Gallery. *Congratulations again to Scott Dixon on his victory at the Long Beach Grand Prix!